Just because they’re budget doesn’t mean our guest rooms are basic. Besides the blessing of staying conveniently central while enjoying a major cost-saving, you’ll make yourself at home in an eye-blink. Spotlessly clean and completely comfortable, these definitively modern Thai-styled boutique suites revolve around a large double bed steps from a fully-accessorized ensuite bathroom with shower and bath tub. Relax in complete privacy, turn on the flat-screen TV and surf the cable channels. Boil a kettle and make a cup of tea or coffee and connect with your friends around the world via your device logged into our free WiFi Internet. 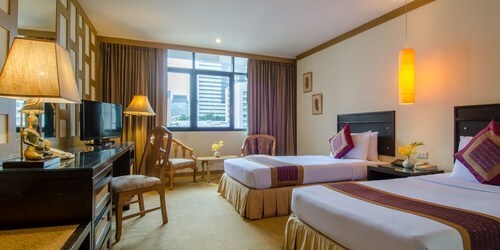 All rooms and boutique suites are fully air-conditioned with in-room temperature control. Despite being right in the heart of things, they also enjoy intriguing city views. Choose from Deluxe, Executive, and Corner Suite categories. 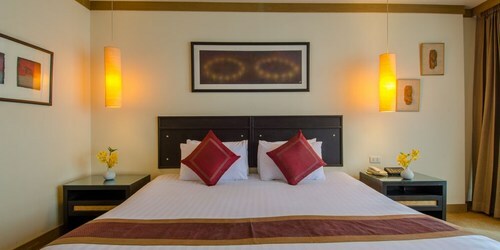 Deluxe rooms come with 28m2 of space. Our bright Executive Rooms offer 30m2 of space and a quaint courtyard view through floor-to-ceiling windows. The same goes for Corner Suites which also come equipped with a DVD player. 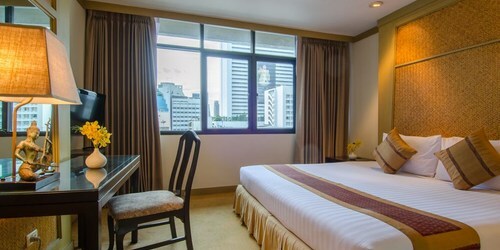 Don’t delay, make a booking in Bangkok city for a social stay near Silom Road. Your reservation is the key to amazing shopping and dining, Patpong nightlife, and unforgettable City of Angels experiences.